For a home defense or self defense handgun, simplicity and reliability are paramount. That said, there are several accessories which can provide the law abiding citizen with an advantage in a home defense situation, without adversely effecting the simplicity and reliability of the handgun. Laser sights make quick aiming and firing easier, and can be a valuable addition to a home defense handgun. A laser can also help when aiming and firing the hand gun from a non-standard position, such as while in bed. This is important, since criminals don’t tend to break in to your home while you are wide awake and in a perfect Weaver firing stance. I personally prefer the LaserMax lasers, although other people I know swear by Crimson Trace. Both are high quality, and I would recommend either over an accessory rail mounted laser since the rail mounted variety are more prone to misalignment (which is not something the LaserMax lasers ever need). 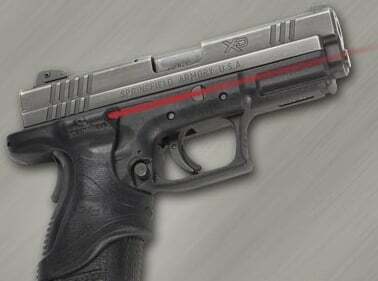 For more information you can read my reviews of the Crimson Trace LaserGrip and the LaserMax. A tactical handgun light can help the user be sure of his or her target, since it is *never* acceptable to fire until the target has been identified. This is especially true in the home defense scenario, since that bump in the night could be many other things than a home invading criminal. 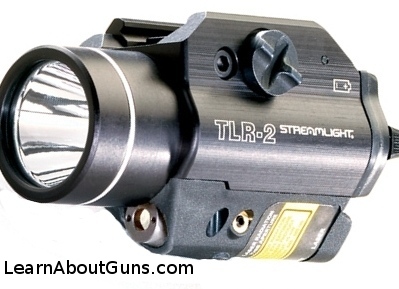 These tactical lights attach to the handgun and are durable enough to withstand the recoil. They produce a bright white light, which can help identify and disorient a criminal in the home at night, and even disorient the criminal if the light is shined in their eyes. On the down side, the light will give away your location, so it is a matter of personal choice as to whether a handgun light is used. Keeping extra magazines on hand is a must, especially in states which ban standard capacity magazines and force law abiding citizens to use low capacity magazines. The ability to quickly reload can mean the difference between life and death. An added benefit of having extra mazaines is that you can keep some loaded and ready to go, while others are left empty so as to not wear out the spring. Rotating your magazines this way will extend their lifespan. A hangun safe is a great way to securely store your handgun when you are not home, to prevent theft or accidental use by a child. Remember, it is the responsibility off every gun owner to keep their guns secure from theft or misuse. Note: If you are unsure which type of gun (shotgun/handgun/rifle) to select for home defense, this article may be helpful. Similarly, this article addresses the proper ammunition for home defense. The recommended accessories for a home defense shotgun can be seen here. I feel that you have left out Tritium based night sights. For my glock G22 it is hard to see my sites at night even with my tactical light on. Glowing green sights will give even greater advantages. Also, while speaking on laser, you didn't mention laser generators that replace the slide recoil spring and rod. Which doesn't add anything to the outside of the pistol. Al and all, I liked the article. What are your feelings on red dot sights? Thanks for the Tritium night sight suggestion.